Despite the fact it feels like spring with temps up to the 60s (or above 15°C), Christmas is less than 12 days! If you’re too busy to bake or not a baker and live in the NYC area, Maison Kayser is there to help you. This year, the internationally renowned French bakery has three beautiful bûche de Noëls, also known as yule logs ($42 for the large cakes shown on this post or $6 for individual slices) that brings fashionable style to the holiday table and also appeases your mouth. 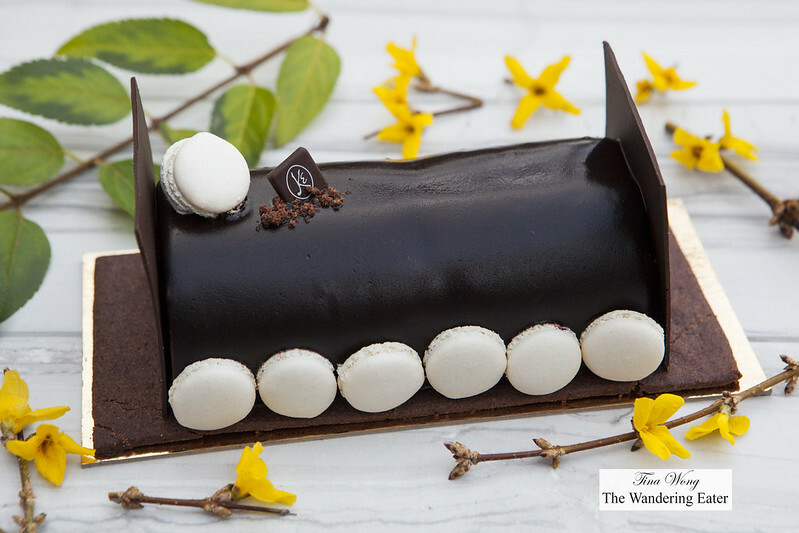 The Bûche Kayser is for the chocolate lover. Layers of deceptively light 70% chocolate mousse, flourless chocolate biscuit, vanilla crème brûlée, enrobed in a shiny chocolate glaze, and dotted with almond macarons. It’s rich and certainly not too sweet. 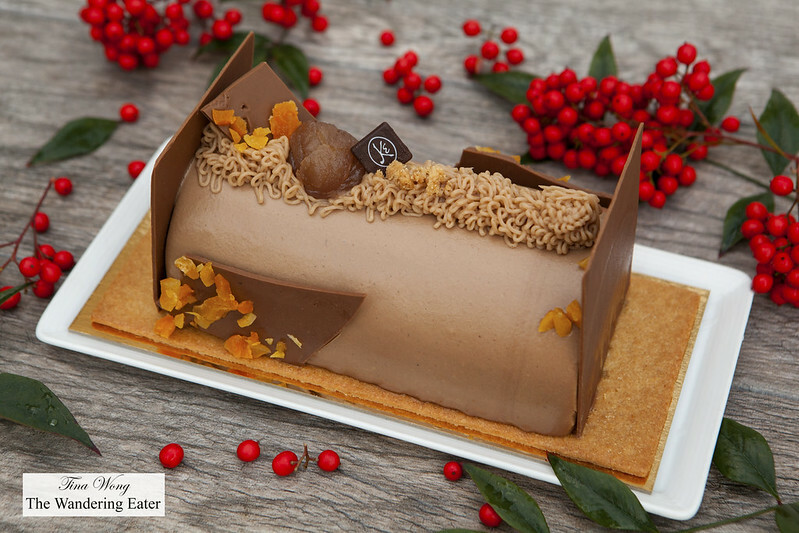 The Bûche Archedoise is a chestnut bûche that is robustly flavored of that wonderful nut with its delectable creamy mousse and highlighted with a touch of apricot. 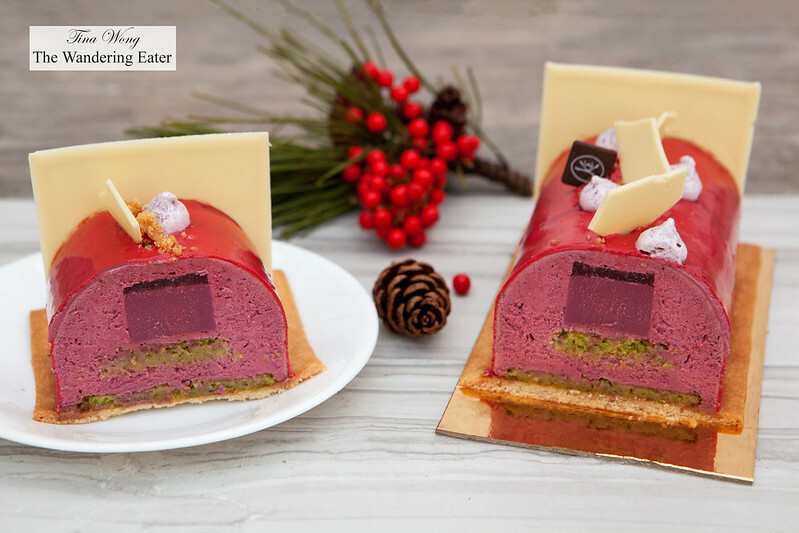 The Bûche Tentation is a festive, vibrant red mousse cake, even when sliced, it has the colors of Christmas. 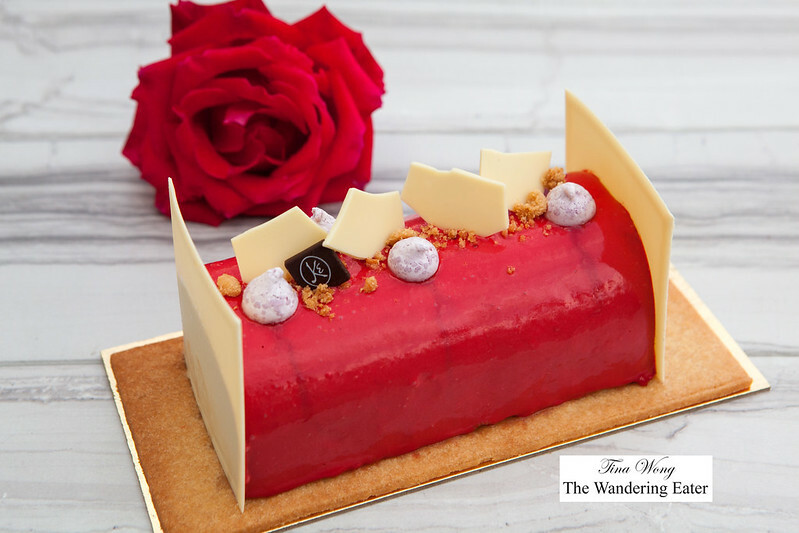 It’s flavored with fruity, acidic raspberry mousse, gelée and layered with pistachio gelée that zings on the palate. 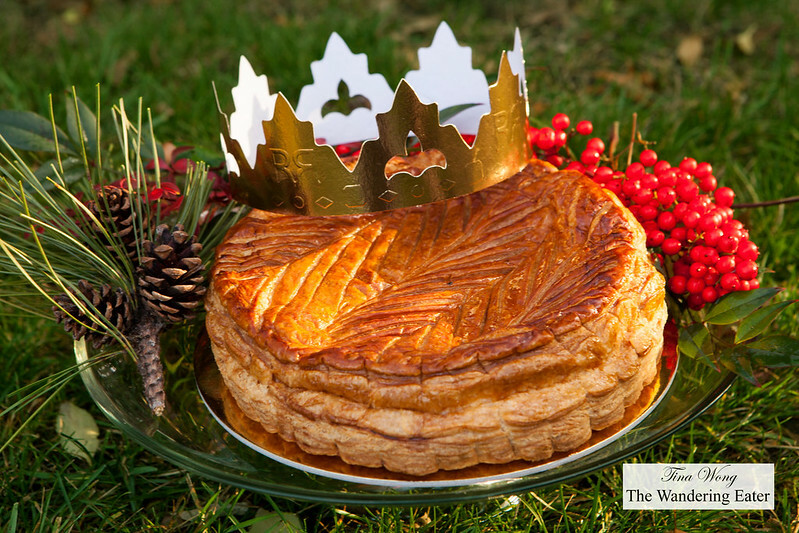 Though it’s a bit early to think about galette des rois or king cake for Epiphany (January 6th) but Kayser always been my go-to. The thick, buttery, flaky puff pastry filled with delicate almond frangipane. If you need a loaf of bread for the holidays, there is a chestnut bread that will be around for a limited time. (Don’t worry, Kayser has at least a dozen other bread loaves and rolls to choose from besides this.) 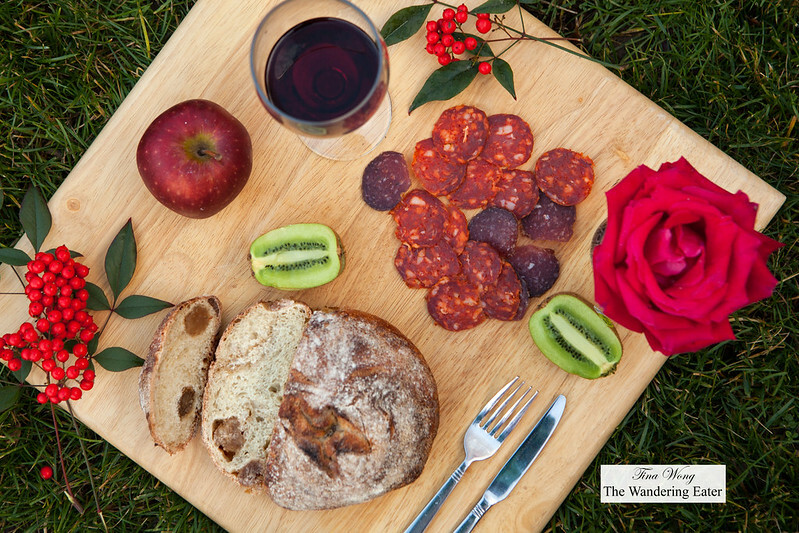 What makes this particular loaf unique is that the bread itself is neutrally flavored and has a wonderful crisp crust and it’s studded with whole candied chestnuts. This loaf can be treated as a sweet dessert type of bread smearing on some fruit jams or richer chocolate spreads or be a bit off-kilter like me and serve it with some savory salami, prosciutto or even better, the nutty Jamón ibérico (the famous, Spanish black-footed, acorn-fed pig) to emphasize the sweet nutty flavors of the bread.